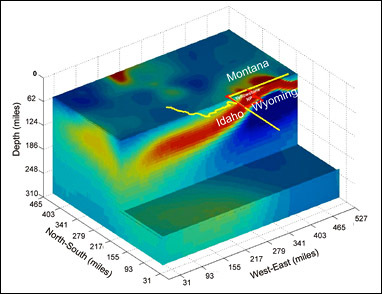 A geoelectric image of the greater Yellowstone area by University of Utah geophysicists suggests the gigantic underground plume of hot and partly molten rock that feeds the Yellowstone supervolcano is even bigger than it appears in earlier seismic images. The study doesn’t address the chances of a cataclysmic caldera eruption at Yellowstone, where three such events occurred in the past 2 million years. Almost 17 million years ago, the Yellowstone plume first erupted near what is now the Oregon-Idaho-Nevada border. As North America drifted slowly southwest over the hotspot, there were more than 140 gargantuan caldera eruptions — the largest type of eruption known on Earth — along a northeast-trending path that is now Idaho’s Snake River plain. The hotspot reached Yellowstone about 2 million years ago, yielding three huge caldera eruptions about 2 million, 1.3 million and 642,000 years ago. Two of the eruptions blanketed half of North America with volcanic ash, producing 2,500 times and 1,000 times more ash, respectively, than the 1980 eruption of Mount St. Helens. Smaller eruptions occurred at Yellowstone as recently as 70,000 years ago. Seismic and ground-deformation studies previously showed the top of the rising volcanic plume flattens out like a 300-mile-wide disc 50 miles beneath Yellowstone. There, giant areas of hot and partly molten rock break off the top of the plume and slowly rise to feed the magma chamber — a spongy, oblong body of molten and partly molten rock about 4 to 10 miles under Yellowstone. In the new study, images of the Yellowstone plume’s electrical conductivity — generated by molten silicate rocks and hot briny water mixed in partly molten rock — shows the conductive part of the plume dipping more gently, at an angle of perhaps 40 degrees to the west, and extending an estimated 400 miles from east to west. The geoelectric image can “see” only 200 miles deep. Based on variations in electrical conductivity of underground rock, this image shows the volcanic plume of partly molten rock that feeds the Yellowstone supervolcano. Yellow and red indicate higher conductivity; green and blue indicate lower conductivity. The lesser tilt of the geoelectric plume image raises the possibility that the seismically imaged plume, shaped somewhat like a tilted tornado, may be enveloped by a broader, underground sheath of partly molten rock and liquids, according to Smith and University of Utah geophysics professor Michael Zhdanov. “It’s a bigger size” in the geoelectric picture, said Smith. “We can infer there are more fluids” than shown by seismic images.